Well I’m glad to say they’ve done it and pretty damn good it is too. More than 200 pages in a hard backed book roughly 12″ square in size. There are literally hundreds of sleeve illustrations most in virtually full size and full colour. There are sections for single artists, compilations, the Dub LP’s, 12″ single sleeves and even Calypso and Gospel. There is also a great section that shows different versions of LP covers next to each other, comparing silk screened sleeves with UK editions and so on. Steve Barrow does the honours with a six page biography of Coxsone and Soul Jazz’s Stuart Baker writes a nice introduction too though some illustrations on these instead of pages of plain text would have been nice. The quality of the sleeve reproductions is not always perfect. Whilst many of the Jamaican sleeves were originally printed on cheap card stock and therefore a reproduction on good quality paper looks nice as you might expect, some of the sleeves have lost some definition, this is most obvious in some of the UK Bamboo sleeves. My only other quibble is that it would have been really nice to have included 7″ label illustrations too. 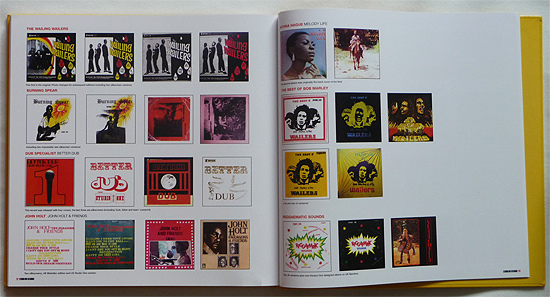 Accepted this is a book about album covers but as they managed 12″ sleeves and a page of LP labels something similar for the singles would have been great. Minor criticisms aside this book is a real joy and clearly a labour of love. 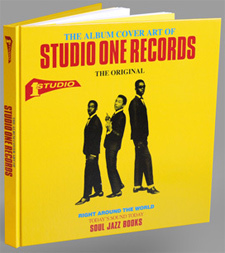 Soul Jazz once again present Studio One in a superb fashion, long may it continue. 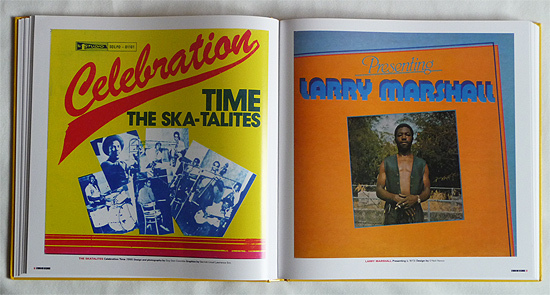 An 80’s Skatalites sleeve and Presenting Larry Marshall from 1973. 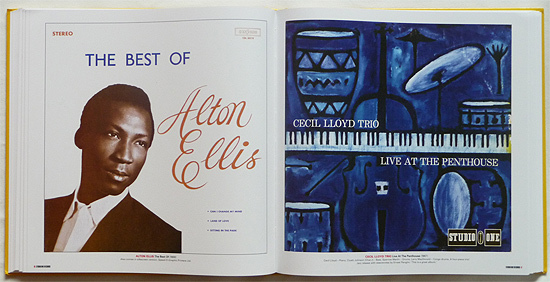 Reggae from Alton Ellis and Jazz from the Cecil Lloyd Trio.